YMCA Barry Gymnastics club is the most successful gymnastics club in the Vale of Glamorgan and caters for all levels and abilities in Men’s and Women’s artistic gymnastics. 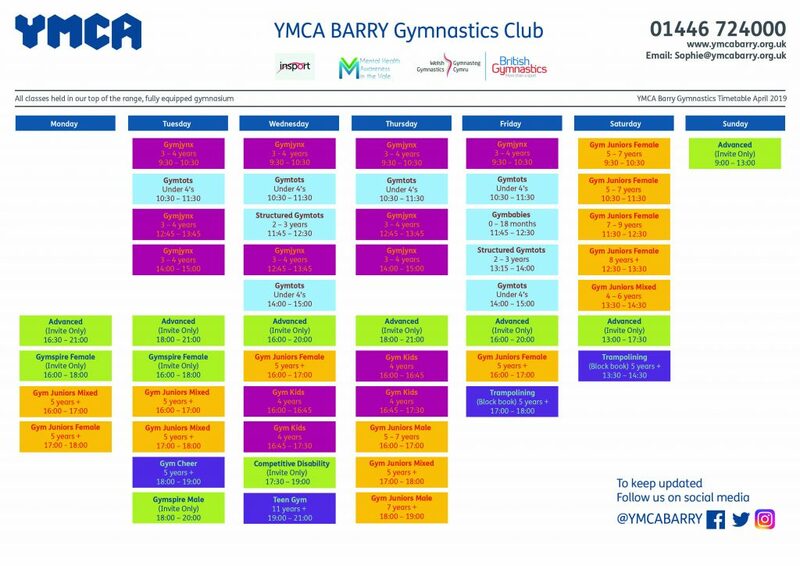 YMCA Barry has a range of classes from toddlers to elite international gymnasts, namely having three gymnasts representing Wales at the 2014 Commonwealth Games and two gymnasts currently training towards the 2018 Commonwealth Games. All classes are run by highly qualified and experienced coaches who all hold current enhanced DBS checks and safeguarding and protecting children qualifications. All classes require booking in advance with the exception of GymBabies and GymTots which are drop in, pay as you go sessions. This is a drop in parent and toddler session for children under the age of 2 who will be introduced to gymnastics in a safe and sociable environment. No older siblings will be allowed into this class as this is the opportunity for our youngest members to have full access to the gymnasium. A drop in session for children under 4 years old accompanied by parents/guardians. The class is semi structured, with a combination of free play and coach led activities where the children will lean basic gymnastic movements alongside their parents in a fun, safe and child friendly environment. A drop in session for parents and toddlers aged 2 years and over. A fun, sociable and engaging structured session where coaches will work with parents to introduce the children to the fundamental movements required for gymnastics. From ages 3 and over, GymJynx offers your child fun, structured gymnastics lessons. Children are encouraged to develop their social skills as well as physical attributes such as balance and coordination necessary for all physical activities. To gain and often to improve your child’s independence, attendance at the class is without parental supervision. Following on from GymJynx, GymKids progresses the children to the next level of gymnastics for 4 year olds who are in school. Children will focus on the foundation gymnastics skills and develop their key fitness components. For children aged 5 and over, there are age and gender specific classes along side mixed classes available. We welcome all gymnastic abilities and coaches work with all children to reach their full potential using all our elite gymnastics equipment. All gymnasts will be invited to participate in club competitions but are not compulsory to ensure all children feel comfortable and confident. Please see the age and gender specification on the timetable. A gymnastics class specifically using the trampolines and trampettes. A fun and safe way to learn new gymnastics skills. Suitable for 5 years and over. For children aged 5 years and over who want to combine gymnastics with cheerleading. The cheerleaders will learn dynamic gymnastics skills alongside the basic cheerleading principles. Aimed at girls and boys of all abilities but must be of secondary school age. The class has been developed for young people who do not want to attend a fully structured session. Those attending have freedom to choose what they would like to achieve in the session and supported by the coaches to achieve their goals. Fun and innovative way to get fit. All abilities are welcome and participants will have full use of the gymnasium. This is a drop in session so there is no need to book. 16 years and over only. YMCA Barry operates a selection process from the Boys, Girls artistic and Rhythmic Recreational into the competitive and Advanced sections. For more information on progression roots, please speak with the head coach of the section. The club regularly competes at competitions throughout the UK in the respective disciplines, and progression into the Competitive and Advanced section requires a commitment from gymnasts and parents alike. Children as young as six are currently training in our competitive and advanced sections, regularly training a few days a week, both here and in the National Squad set up with Welsh Gymnastics. YMCA Barry is a recognised Regional Centre of Excellence for Male Artistic Gymnastics and home to the Welsh National Coach. Many YMCA Barry gymnasts over the past 24 years have represented and competed for Wales at the Commonwealth games. All of the coaches at YMCA Barry are British Gymnastics DBS checked and qualified to the appropriate coaching levels.